Pender Island is one of the Southern Gulf Islands on the coast of British Columbia, Canada. Pender Island lies between Vancouver (on the mainland) and Vancouver Island and is approximately 34 km2 (13 sq mi) in area and is home to about 2,500 permanent residents, as well as a large seasonal population. Pender Island enjoys a sub-Mediterranean climate and features open farmland, rolling forested hills, several lakes and small mountains, as well as many beautiful coves and beaches. In fact, Pender has the most public-access beaches of all the Gulf Islands, which makes it a perfect place for sea kayaking. Pender Island consists of two islands, North Pender and South Pender, which are separated by a narrow canal and connected by a one lane bridge. 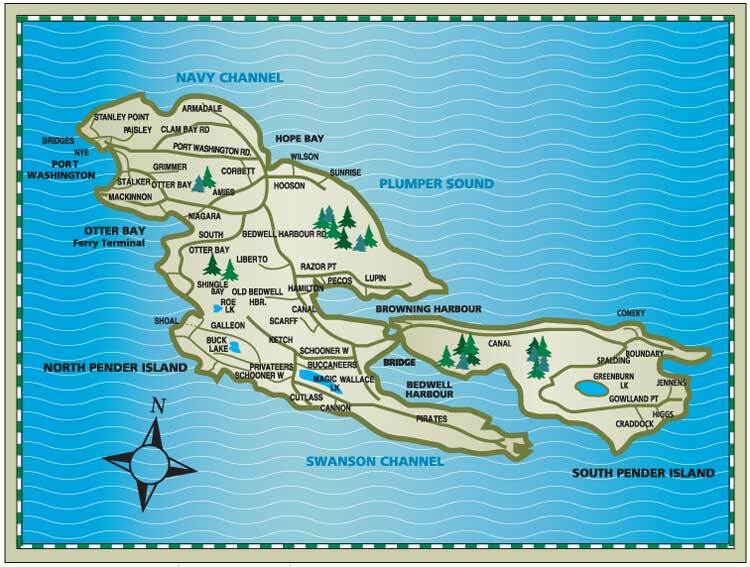 Most of the population and services reside on North Pender Island, with the highest concentration surrounding Magic Lake. South Pender Island is generally more rural, but offers some of the best vistas on the island. Pender’s quality of life, warm Mediterranean climate, arts community and leisure activities is what attracts residents and visitors to the island life.